Takeaway: I'm a millennial who keeps an eye on the latest whole food and health food trends. Here are 4 ways that food brands and retailers can catch and keep my attention, and ultimately earn my brand loyalty. As a 20 year-old constantly surrounded by fellow millennials in vibrant city of Boston, I’m the ideal demographic for a large number of food brands and retailers. Although 57% of millennials said they had been personally affected by the Great Recession, just 8% reported cutting their spending on groceries. In fact, my generation is dining out less and eating at home more. In other words: We're buying more groceries! In addition, 53% of millennials expect to change their eating habits in the next year-- my generation is becoming increasingly aware of what we put into our bodies, and is demanding real, whole-foods products. While much of that consists of farm-to-table or fresh produce, much of it is also packaged health-oriented products sold on grocers’ shelves and online stores. Because of this, the competition between brands and retailers to properly market and sell their products to my generation is fierce. Rest assured, I’m here to help. Over the past few months, I’ve paid close attention to why I decide to buy a specific snack or meal. I’ve not only paid attention to what draws me in, but what attracts my peers. No surprise, much of our purchase decisions are driven by product content. 1. Detailed product content. Every minor detail matters. 32% of millennials are willing to pay more for sustainably sourced ingredients, and healthy food products in general. 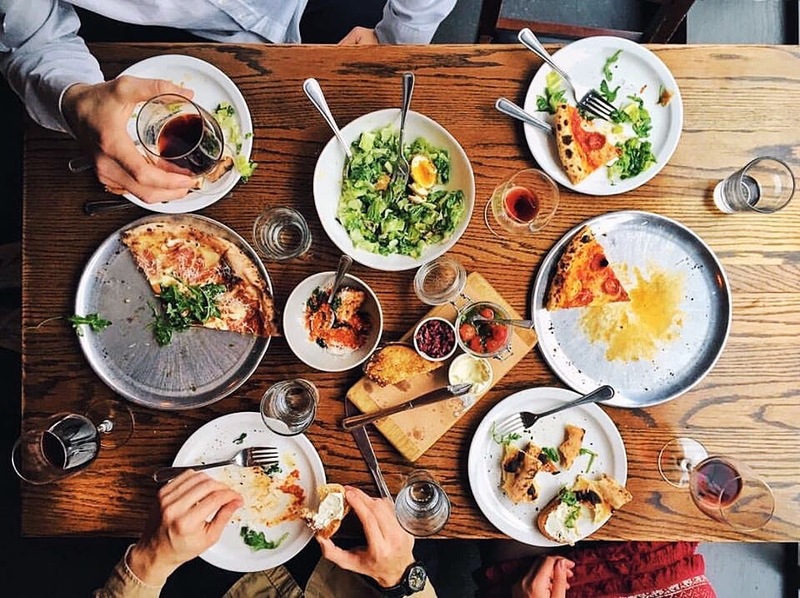 More than other generations, we are nitpicky and meticulous, especially in the context of food; we pay close attention to what we consume and are changing how food is being thought about. We are pushing for healthier, more honest food products in the market. We pay attention to the ingredients, nutrition label, packaging, reviews, the product’s “story”, where it’s made, who made it, and if available, even why the product was created. Growing up in a digital era, we’ve been able to look something up on our phones instantly. When we buy, this easy access to so much information means we’re even pickier. Recently, I was searching for a protein bar to order off Amazon and spent over 20 minutes filtering through dozens of separate brands’ products. I didn’t decide on one until I came across the Raw Rev Glo Protein Bars, which provided all the information I wanted. Once I saw comprehensive images of their ingredients and nutrition labels for each flavor, as well as such honest reviews of the product, I decided to order in bulk. Informative product content and customer reviews sold the bar to me. 2. Accessible information. Speaking of detailed, quality product content-- Is that content easy to find? Can it be efficiently located? It is beyond easy to open google on our phones or laptop and search for something; if for any reason it’s difficult to find information about a product, millennials will give up and exit out almost instantly. 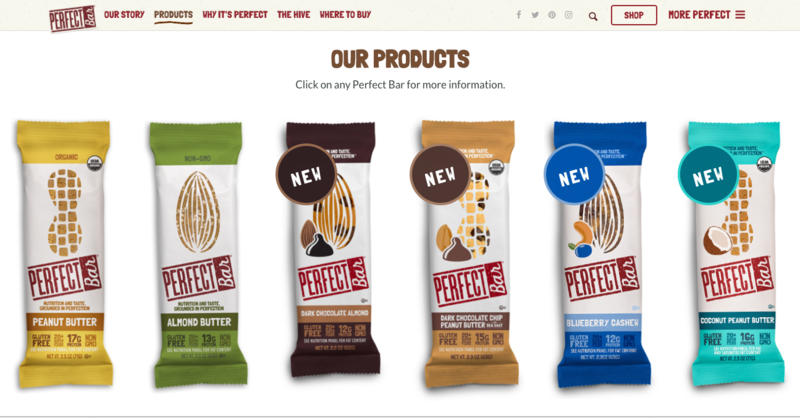 Perfect Bar, a brand that sells Non-GMO, gluten-free, superfoods-packed protein snacks bars, does a great job displaying their product information. But I especially appreciate their no-brainer, easy-to-use website interface. From the moment you’re on their website, you can find whatever information about the products you’re looking for in just a few clicks. Consumers can see all the products in-one-page by scrolling up and down, and then easily click on one to learn everything about that flavor, including what it’s meant to taste like, its ingredients, and nutritional information. All the information is organized in a clever, straightforward fashion, making it an effortless process to locate any product’s information. 3. Brand transparency. The more transparent you are as a brand or retailer, the more we like you. Millennials appreciate honest brands, and want to support a brand that best-represents them. A company that exudes honesty and sincerity is most likely to succeed with my millennials. Sixty percent of millennials have said that they are often or always loyal to brands that they currently purchase from. We want nothing more than to feel best represented through every aspect of our lives, whether it be our the filter we choose on Instagram, the purposely-mismatched socks we wear, or the nutrition bar we choose to consume. Everything we own, use, and consume is in our minds (even if only subconsciously) a reflection of “who we are”. Each of us work hard to create a personal brand, which entails purchasing products that we will will contribute to our “brands”. Vain or not, it is the reality of the millennial consumer. With that information, strive to grow and communicate a brand or company image that will resonate with consumers. 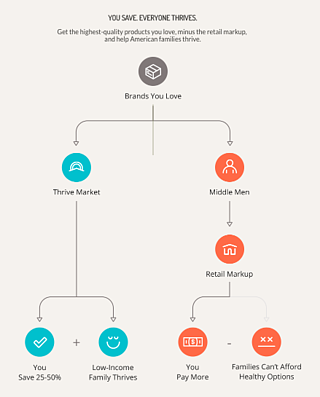 Thrive Market is an online retailer and whole-foods grocer that does a notably impressive job with brand loyalty. It not only sells discounted high-demand products (ranging from pantry goods to skincare), but also “implements advocacy campaigns that help make our world a better place.” For each Thrive Market Membership created, the same membership and benefits will be donated to a low-income family, teacher, veteran, or student. Beyond the social-justice-driven aspect of the company, all products are always 25 - 50% off retail price, which serves as a strong incentive for money-conscious consumers to buy. For each product sold, a great, useful amount of information about the specific product and brand, as well as all the nutrition information is located conveniently under the images. Thrive successfully communicates a strong company image, and its brand loyalty resonates with consumers. 4. Product Narrative - Millennials love brands and products that tell a story. There is no better way to engage consumers, specifically my generation, than to intimately communicate a narrative that brings life and worth to a product. Whatever the narrative, hone in on your company, brand, or product’s message that you hope to communicate to consumers, and make it a memorable one. 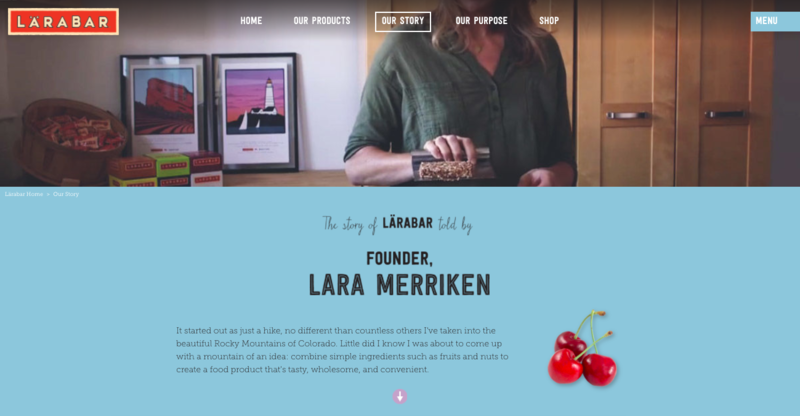 Larabar, founded by Lara Merriken, produces healthy, gluten free energy bars made from minimal, whole food ingredients. They’re found in most grocery stores and through many retailers online. The company’s approach to its narrative is well-executed and memorable. Lara Merriken tells the simple story of how the bars were founded when on a routinely hike in Colorado, she had the idea to create her own clean bars and it began from there. It is a relatively simple and ordinary story. However, the way the story is told online - through text and limited visuals - is reflective of the brand concept itself. It all ties together; the simplicity of the story and more importantly, how it’s communicated, is why it’s so well-received. Everything circles back to quality product content-- without it, a company will not succeed. Millennials have grown up with the increasing accessibility to a surplus of information; we created the need for instant gratification. In the next 10 years, online grocery sales are expected to grow from 4.5%/$20 billion to 20% share reaching $100 billion. Brands and retailers cannot afford to fall behind and lose thousands of customers because of poor product content. Learn how to implement an effective product experience management platform at your company by using the Winning at Distributing Commerce Whitepaper as a guide.